24 VACNAMRUTS - Pushtikul Satsang Mandal | Forums | Disscuss it all. Shri Gokulnathji had made 24 Vachnamruts that explain the Pushtimargiya terminologies. This Vachnamruts were made by Aapshri in front of krupa patra sevak Shri Kalyan Bhattji. At first and foremost vaishnavs should not do anyashray. They should have full faith of one and only Shri Nathji, His firm shelter shall fulfill all desires n everything will happen properly. So firmly believe in Shri Nathji only don’t wander everywhere. Then too human nature is such that can’t remain without asking for something. This world is like big tree giving two fruits happiness and sadness. It’s branches are minds thoughts that come very often. The roots are dependant on mind. Strong mind n proper nourishment shall make the tree strong. So if mind i.e. roots are strong then this tree can remain firm in heavy storms of worldly affairs. Here finally root is our Thakurji so when you shall forget Him this tree is gonna to fall. But jeev is forgetting this fact and considering world, home, wife, children as everything considering then to be the branches n then getting bitter fruits. Then realizes the mistake n fears for wht to do so that I won’t fall from this tree, how to get safety?? Here indirectly jeev gets confronted with anyashray . Then how jeev is gonna to get a safer place in this world??? Only firm n fix shelter of Shri Nathji, Shri Thakurji can do this. So never get in the vicinity of anyashray. Don’t have asarpit. Coz Shri Mahaprabhuji is also with only those jeevs who have firm Ashray in Thakurji n don’t take asamarpit. Follow this two practices so that your mind becomes healthy n strong , then only jeev can get happiness n comfortable feel in this stingy world. In this vachnamrut Shri Gokulnathji says Vaishnav should have kindness on all jeevs, should consider all jeevs as Shri Thakurji’s different forms n should also consider there comfort. Vaishnav should always take care that no one gets hurted by him/her either by words, mind, body, deeds n should try for well-being all jeevs by all means. 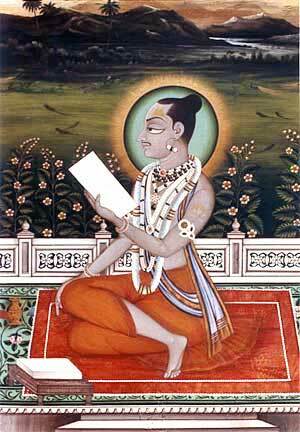 Thus foremost duty of Vaishnav is to consider for comfort of all jeevs. In this vachnamrut Shri Gokulnathji says Vaishnav should consider feasible or miserable situations same, should not get either happy or depressed in any situation. Vaishnav should remain humble and have full faith in Shri Thakurji. Should use body, money and mind in serving Hari, Guru and Vaishnavs. There should not be any hesitation in reciting Thakurji’s name; if it remains then true form of Thakurji can’t be understood. Thus true Vaishnav should be satisfied in all situations, n use ones belongingness in serving the best to Hari Guru n Vaishnav. Monicaji, Congratulation for starting beautiful topic. This topic is very precious as it is told by Vallabhbalak.It will guide vaishnavs. In this vachnamrut Shri Gokulnathji says Vaishnav should never get angry coz anger is form of ghost. And Thakurji doesn’t likes anger He just leaves the place n atmosphere of anger. Thus if you are angry Thakurji is not with you. Anger is form of fire it burns the Bhagwad bhav and dharm in you. ‘sarp yoni’ etc. Hence one should be very conscious that vaishnavs don’t get disturbed. If one burns someone’s house under jealousy or anger then goes to hell. If one gives poison or drowns someone in water out of anger or jealousy then gets place in hell and takes birth of snake. If one criticize Guru under anger then gets birth of mouse, then snake then becomes ghost. If one gets angry with parents without any Bhagwad dharm then becomes poor. If one gets angry with vaishnav , Bhagwad dharm gets destroyed. This way Shri Gokulnathji conveys vaishnavs that anger is greatest hurdle and sin in vaishnav dharm so vaishnav should always be cautious of it. In this vachnamrut Shri Gokulnathji says vaishnav should have full and foremost faith in Shri Thakurji. So instead of getting tucked in worldly affairs vaishnavs should concentrate their impish mind in remembering n thinking of Shri Thakurji as described in Pushtimargiya books. Similarly should also remember one’s Gurudev. Likewise vaishnavs remember Shri Thakurji’s name , should also try to concentrate on Shri Thakurji’s swarup from toe to head with all the shringar, His leela’s.If some time wastes without reciting and remembering of Thakurji then true vaishnav feels that he has missed golden opportunity. Then gets bathe in apras, takes charnamrut, Shri Yamuna raj n feels the divinity, gets acquinted with Bhagwad dharm n restarts seva. Vaishnav should do seva of one’s Thakurji along with seva in Haveli like washing utensils, making malaji, etc. Should see properly the Utsav prakar n follow it. While doing seva vaishnav should have the feeling that he should not commit any mistake, for that should remember Shri mahaprabhuji and request Him to guide properly. After seva vaishnav should spend time with vaishnavs in satsang, should respect them, greet them wholeheartedly .If doesn’t gets vaishnav company then should accompany holy books, books are also great vaishnav. Nice posting in english, please do continue when you have time. In this vachnamrut Shri Gokulnathji says vaishnav should never try to show-off one's seva, bhagwadsmaran, dharma etc.... n should never do it for earning. Likewise Brahmin's do Gayatrijaap n does seva with 'ek kalo dwikalo va'. Again Shri Gokulnathji says Vaishnavs should never do seva for showoff coz Thakurji never accepts it n vaishnav gets birth in hell. Great Efforts Monicaji., Please continue to add the remaining Vachnamruts of ShriDadaji ShriChaturthkumar ShriGokulnathprabhucharan. In this vachnamrut Shri Gokulnathji says that Vaishnav should never find any mistake or sin of others. Even if he sees / hears any of mistakes or sin of others through his eyes / ears ; should think like ‘I’m touched by ‘maya’ so I see the dosh of others… actually no one is having dosh’. This way vaishnav should try to see the best in others… though others don’t behave likely, may be jealous or do wrong deeds Vaishnav should not mind it instead should try to show off the best in others and try to please them so that they may change.. doing the wrong deeds. This way Vaishnav remains away from the main hurdle of seeing others dosh and gets closer to Thakurji and becomes His krupapatra to get the immense ‘bhakti’ of Thakurji.